I was sent a set of amazing handmade soaps from Linda at The Enchanted Bath. The pictures I’d seen online and the ones I’ve taken do not even come close to doing her soaps justice. First off when I opened the package she sent me I was amazed at the lovely attention to detail of how each item was carefully packaged. The first item I opened was the set of four deliciously scented yellow sugar scrub cubes. I absolutely LOVED the fruity scent that lingered after use in the shower. This was my most favourite scent of them all! Each cube lasted me two washes and felt amazing as they gently, but throughly exfoliated my skin. 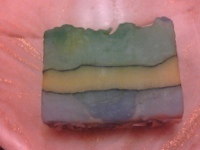 Next I opened a beautiful green and purple slice of Engery soap. Oh my goodness the incredibly invigorating scent made my entire shower smell wonderful! I just love how fabulous this soap feels! It lathers up so well and I never want it to run out! If only there was such a thing as ever lasting soap (like the ever lasting gob-stoppers in Charlie and the Chocoate Factory. Speaking of the Chocolate Factory, the next soap I opened was Choco Loco! And it sure smelt like it belonged in Willy Wonka’s factory. I have loved chocolate soap ever since my mom bought me a slice of Chocolate soap when I was a preteen and so chocolate soap always reminds me of my mom who passed away 3.5 years ago now. For some reason it is very difficult to find chocolate soap anymore and I so appreciated being able to have those positive memories brought up again. There were even marshmallows on top of the slice like a cup of hot chocolate! 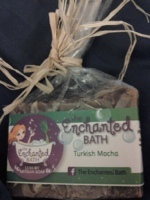 And another of Linda’s amazing soaps that also has chocolate in its scent is her Turkish Mocha soap. mmMmm this one smelled just like a cup of hot mocha coffee and good enough to drink! Incredibly, there were chocolate shavings and coffee beans on the top of this slice which just added to the amazing detail, thought, and care that was obviously put into making this delicious smelling and silky feeling soap. 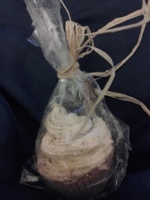 Last, but not least I was sent an incredible looking soap that amazingly looked just like a cupcake! I do not know how she is able to do it, but it truly did look just like a pumpking spice cupcake complete with a cinnamin stick on top! There is even ‘frosting’ on top of the soap cupcake. I have never seen anything like that before! If I didn’t know, I would NEVER have guessed that that cupcake was indeed soap and not edible. 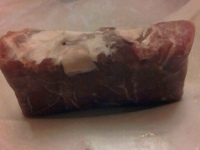 And not only did it look amazing, but it smelled incredible too! I am very grateful and apprecaitive to Linda at the Enchanted Bath for sending me such an amaing sampling of her fabulous soaps. Even though a 5 is the highest score on my rating scale, if there was a higher number I would have given it to her creations. It is obvious that Linda is passionate about making soaps as her attention to detail is just incredible. 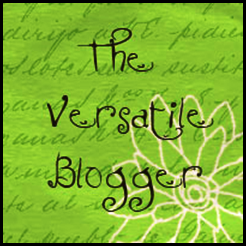 Disclaimer: I received these soaps free from The Echanted Bath in order to write this review. 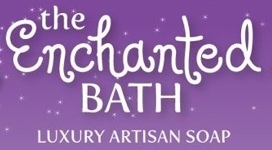 You can also find The Enchanted Bath on facebook. 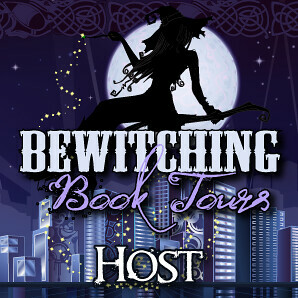 Please see my disclaimer for any more information.